What is a Tracking Software? PPV is one of the most underrated traffic types, but also one of the hardest to master. Many marketers have excellent results with this type of traffic, but there are also many who fail to monetize it. I’m not someone who lives from the promotion of CPA offers and this post wasn’t created for those of you who are already CPA experts. What I’ll share in this article are things that I’ve learned by trial and error. Moreover, while I made tremendous progress since I’ve started promoting CPA offers, I’m still far from being an expert. Before getting in on the action, let me help you understand what PPV is. Knowing more details about this traffic type and how it’s generated will help you improve your approach and strategy. The pay-per-view model charges you every time someone sees your offer. Remember that – unlike the traditional PPC model where someone has to see your ad and click it in order to reach your advertised URL – with PPV, the user will view your site directly after they access a specific site or type a particular keyword in the navigation bar of their web browser. When you pay for domain redirects, the visitors will be taken straight to your landing page once they access a particular domain name that matches your targeting. The majority of domain redirect traffic comes from typos. When you pay for a popup or a popunder, your landing page appears when someone types a specific keyword in the search bar of their web browser, when they visit a particular domain or a page that includes a chosen keyword in the URL. The difference between a popup and a popunder is that popups show up over the content of a page, while popunders open on a new browser window under the content seen by the user. Popunders usually remain unnoticed until a user closes the main browser window. Most PPV traffic is generated with the help of an adware software installed on people’s computers with their consent. For example, there are many free softwares, games, or toolbars which are powered by ads. That should normally be specified in the license agreement displayed when you install the software. Of course, there are also many people who just click the “accept terms” button without reading the Terms of Service. 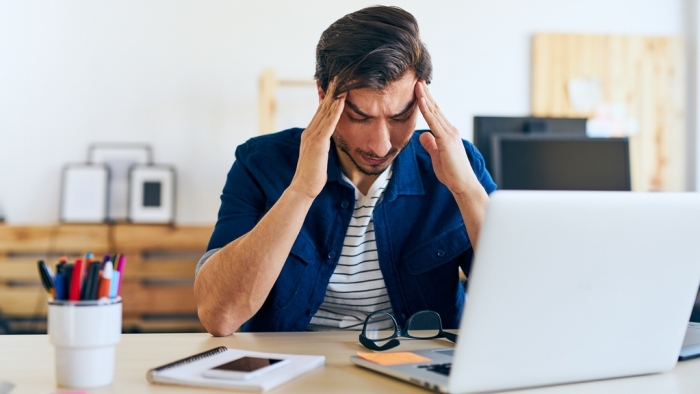 Even though having an adware installed on your computer can be somewhat disturbing, these are usually harmless, unlike trojans or keyloggers intended to steal user’s passwords or personal information. The main advantage of PPV traffic over PPC is its low price. 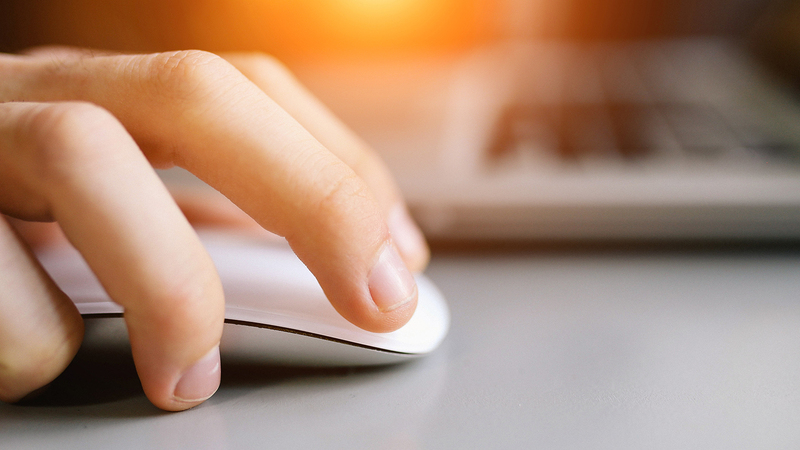 The price per click can easily go over a dollar with the search traffic of Google AdWords. However, with PPV, you can get extremely cheap visitors. The most obvious disadvantage of PPV is that the bulk of this traffic type is of a much lower quality than the traffic received from Google AdWords. The user clicks the ad for a reason. That also means that the visitor has a higher chance of performing an action when they happen to voluntarily click an ad than when an ad pops up on their screen. Now you can see why the views from PPV are much cheaper than the clicks from PPC. How are so many people getting a huge ROI by promoting CPA offers with PPV traffic? There’s no magic secret when it comes to PPV. I would say that the only way to become successful with PPV is TESTING, TESTING, and TESTING SOME MORE. Google AdWords has a rigorous system for making sure they only provide high-quality traffic to their search advertisers. Moreover, they only accept publishers who have websites that meet their quality guidelines for their Display Ads platform. On the other hand, most PPV networks will just send you low-quality traffic. Therefore, a big part of it might be very low-quality traffic or even traffic from bots. Of course the traffic coming from bots is entirely useless and you’ll never see a conversion from such a traffic type. When you use Google AdWords or any other well-known advertising platform, you may get some random conversion even if you don’t use a tracking software. With PPV, though, those chances are much slimmer. Therefore, if you want to see any results from PPV and want to be able to track and scale up your campaigns, it’s mandatory that you use a tracking software. A tracking software is an application that you install on your web server or a hosted service that helps you determine the quality of your traffic. When you track your traffic, you can see where the conversions are coming from, the location of the visitors, you can see what people are clicking on a particular landing page, you can block bots, determine which traffic source ID is working and which isn’t, and so on. Some tracking softwares are cloud-hosted and require a monthly subscription such as Voluum, while others are self-hosted apps (they will ask for a one-time fee, but you have to host them on your own server, which might require some technical knowledge and maintenance work). A cool advantage of working with Mobidea is that you’ll get the chance to use their own affiliate tracker which allows you to create campaigns, track your performance, and optimize in one place without any additional costs. You should always use a tracker to make sure your campaigns are performing to the max! The Mobidea Academy has already published a guide on how to use Mobidea’s tracker. Make sure that you check it out! Many advertising platforms offer PPV as an option. However, they’re not all trustworthy. Some PPV networks are more targeted at experienced marketers. Therefore, they’ve got a higher minimum budget so as to discourage beginners. Wanna check a list of several popular networks that offer PPV as an alternative for their advertisers? I recommend you choose an offer first and select a network based on what offers you want to promote. Because while some networks are specialized in delivering adult traffic, some will only send you mobile traffic, and so on. Before deciding to promote a CPA offer, you have to make sure that you are allowed to promote it with PPV traffic. It’s very important to check this aspect. Otherwise, you may get your account disabled, or your conversions canceled. Let’s assume you want to promote a mobile offer from Mobidea. After you log into your Mobidea account, enter the “Offers” menu. You should see a list of all the offers available. 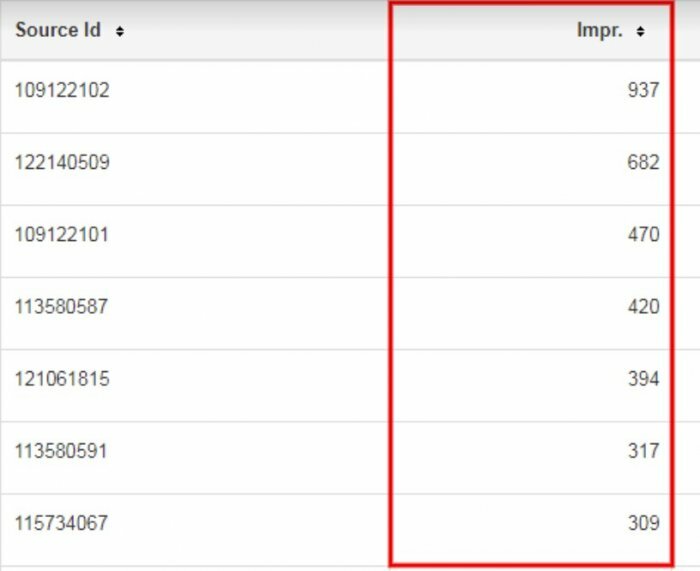 In order to reduce the number of offers you see and to make your offer selection easier, you need to apply some filters to the displayed results. To do that, look at the right side of the page. Since you want to promote your offer using PPV traffic, you can limit the results only to the offers that allow a form of pay-per-view traffic. Click the “Show more” link from the bottom left of the panel until you see all the available traffic methods. 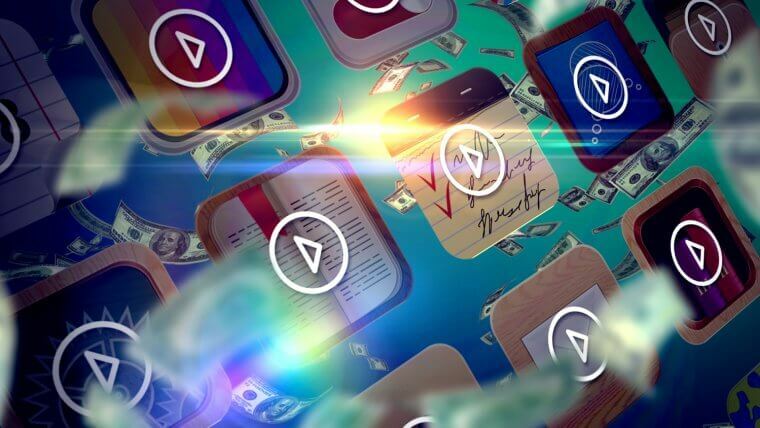 Most CPA networks will have a general option that’s usually called “PPV,” but Mobidea lets advertisers choose a pretty specific PPV traffic method. If you want to advertise your offer with popups or popunders, you should enable the “Toolbar traffic”, or the “Popup or Popunder” filter. If you choose to use the domain redirects, you should check the “Automatic redirection of users without any user interaction (e.g. click)” search filter. That will reduce the number of available offers to only the ones that allow you to use that particular traffic type. To reduce the number of offers even more, you can apply more filters on the right sidebar, such as category, country, etc. 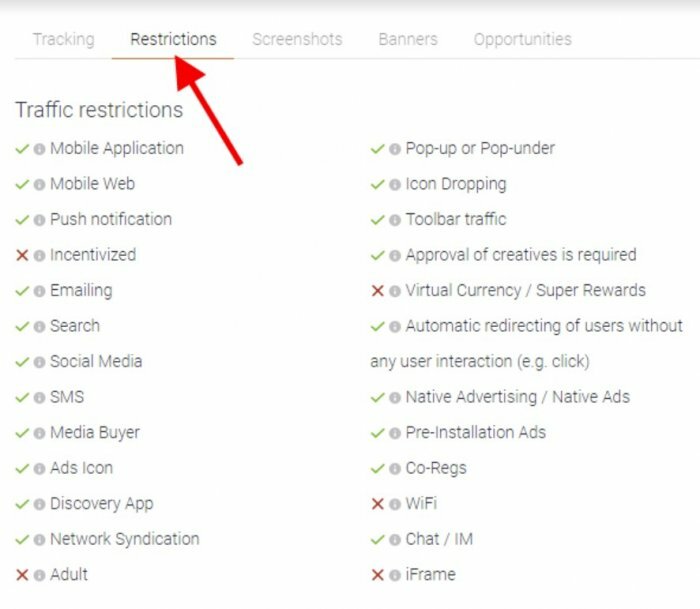 To check the exact allowed traffic methods for each offer, go to the offer’s page and click the “Restrictions” tab. The allowed traffic types are marked with a green checkmark and the restricted traffic methods are labeled with a red “x”. Click the info icon before each traffic type to see a brief description of that particular traffic type. Once you find an offer that accepts PPV and think it’s a good choice, there is also some info you should take into account. The allowed countries, whether or not you’re allowed to use custom creatives (landing pages, banners, etc. ), and whether the offer has received any conversions in the last 7 days (you can see that under the Opportunities tab on Mobidea). If you want to be entirely sure whether or not an offer accepts your chosen traffic type, you can ask your affiliate manager. 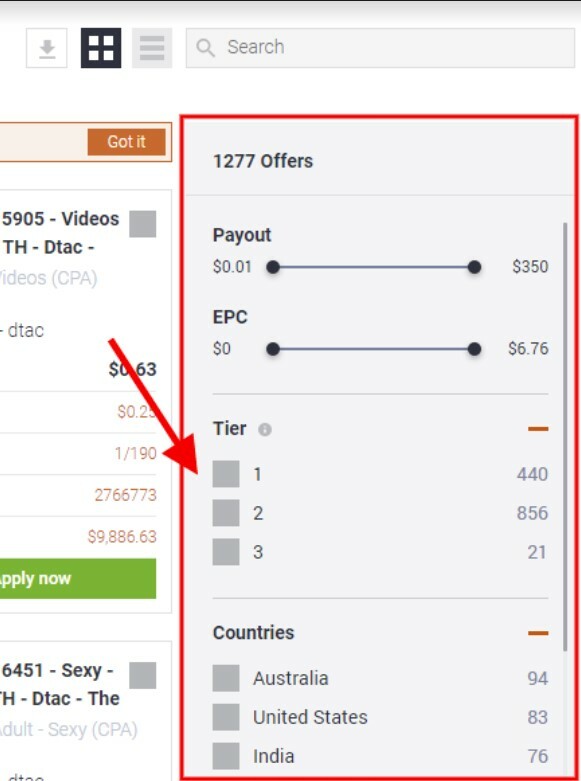 Once you know what you’re allowed to do, you can apply for that offer and receive your unique affiliate link. Don’t look at the highest paying offers only. Usually, the offers that pay the most require a more complex action from the user such as a purchase, credit card information input, filling a form with many input fields, etc. With PPV traffic, I had the best results with offers that pay for a simple action. An email submission, a free signup, a software download, a simple form submission, trials, gifts, free app installs, etc. After you’ve chosen an offer, you’ll know what are the accepted traffic types, OS, operator, whether it accepts Wifi traffic, and so on. If you’ve decided to promote a mobile offer from Mobidea, you must first check if the PPV network allows you to send mobile traffic. What would be the point of sending desktop traffic to a mobile offer? That would be wasted money. Then, if the offer only accepts a particular operating system or a specific mobile operator, you have to make sure that the network gives you enough options to filter the traffic based on these criteria. A good PPV network should give you a lot of targeting options. SelfAdvertiser is a PPV network that gives you many targeting options. “Run of network” means that the network will send me all the available traffic, without targeting a particular keyword or domain. The “Run of network” can send you a high volume of traffic in a very short time. If you decide to go for this option, make sure your tracking software and landing page can handle all the traffic. I almost never use this option, but one of the advantages of the run of network is that you can get a lot of data fast. Still, to make a campaign profitable with this approach, you’ll have to closely monitor your data and exclude a lot of traffic source IDs (I’ll refer to this later). I wouldn’t advise you to start experimenting PPV with this method. The “Keyword targeted” option enables you to receive more targeted traffic and only display your page to the people who are looking for a particular keyword. Whether I choose the “Domain Redirect”, or the “Pop” alternative, I like to use the “Keyword targeted” option. Let’s check the targeting options of SelfAdvertiser, one of the networks I’ve used for several campaigns. A proper PPV advertising platform should have features that enable you to filter the traffic based on several fundamental criteria. Firstly, you should be able to filter the traffic based on user location. SelfAdvertiser has a broad set of options that allows me to be super specific with my targeting. I can filter the traffic. Besides targeting options, it’s crucial for the network to give you an easy way of blocking the traffic sources that do not convert. If the chosen ad network doesn’t have at least an option that enables you to block the traffic based on the source ID, then it’s not a good network. After you receive some traffic on your campaign, your tracking software should provide you some info about the traffic. If you’re tracking the traffic correctly, you should see the traffic volume received by each source, the number of conversions you had from a particular source, as well as other data. Once you notice that a source has sent you a decent volume of traffic, but you had no conversions, you can then block that ID from the options of the advertising platform. Just like for any paid traffic promotion, when you promote CPA offers with PPV traffic, targeting the right audience is crucial. Unlike PPC, where you can only target particular keywords, PPV also allows you to target specific URLs. That means your pages will be seen by the target audience when they visit exactly those URLs. For instance, let’s assume you promote an app for Android OS. If you add the URL of the Google Play Store to your list of targeted URLs, you have the power to place your ad in front of the people who access the Google Play Store and who are interested in an app for Android. There are many paid and free software and online services that can help you to find a list of keywords to target for your PPV campaigns, such as SEMrush (30-days free trial). If you’re just getting started, there’s no need to pay for an expensive service. There are several excellent free keyword research tools that you can check for this process. For this guide, I will only use a free tool called Google AdWords Keyword Planner. 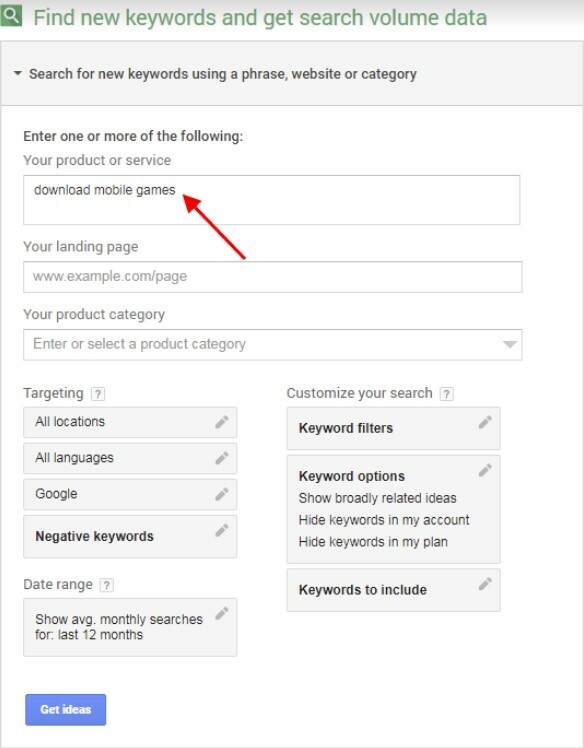 You can get access to the Keyword Planner once you have a Google AdWords account. If you don’t already have an account, go for it. Once you have a Google AdWords account, you can access this tool here. Start your keyword research by providing one or more keywords related to your offer. Or, if you know the landing pages of some of your competitors, Keyword Planner also enables you to start your keyword research by analyzing the terms found on a particular page. Based on the keyword provided, or the landing page, Keyword Planner will give you a list of related keywords. If you don’t want to risk spending your money on unrelated keywords, I would advise you to go through this list manually and only keep the best key phrases. Otherwise, if you just want to block the keywords that don’t perform well from your advertising network account, you can just add all the keywords to a list and copy them, or export the list as a .CSV file. After you’ve gathered a decent list of keywords, just copy and paste them into the targeting option of your chosen ad network. As I’ve already mentioned, PPV networks will also allow you to target specific URLs. For this task, you can use one of several paid services. However, I’m going to tell you about a free method. You can easily find a list of sites and pages that may be a good fit for your offer with the help of search engines. More precisely, you can manually copy and paste every URL into a text file. That boring process would take you a long time, though. Fortunately, there’s a quicker and easier method. If you use Google Chrome as your web browser, there’s a free extension called Linkclump. I don’t know if there’s a good alternative for Firefox or IE. Install Linkclump and right-click on its icon. If you want, you can set different controls. Now, open Google.com in your web browser. In the bottom-left of the page, you should see a “Settings” page. Click that link and click on “Search Settings” from the options list. Next, drag the bar from the “Results per page” option to the maximum value (100). Save the settings and return to Google’s front page. 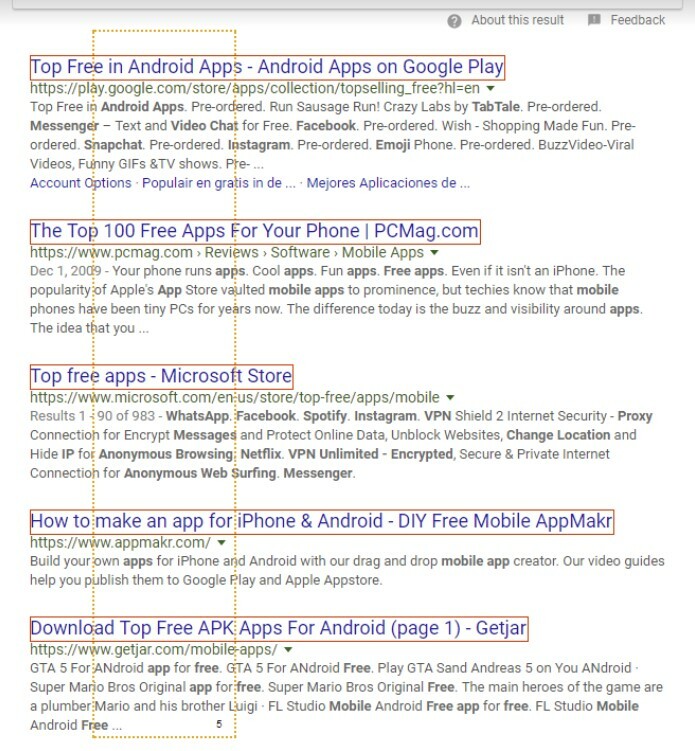 Type a search term that’s related to your offer (example: “free mobile apps”) and hit the search button. Now, you should see a list of 100 pages about your chosen topic. If everything works correctly, you should see a selection line. 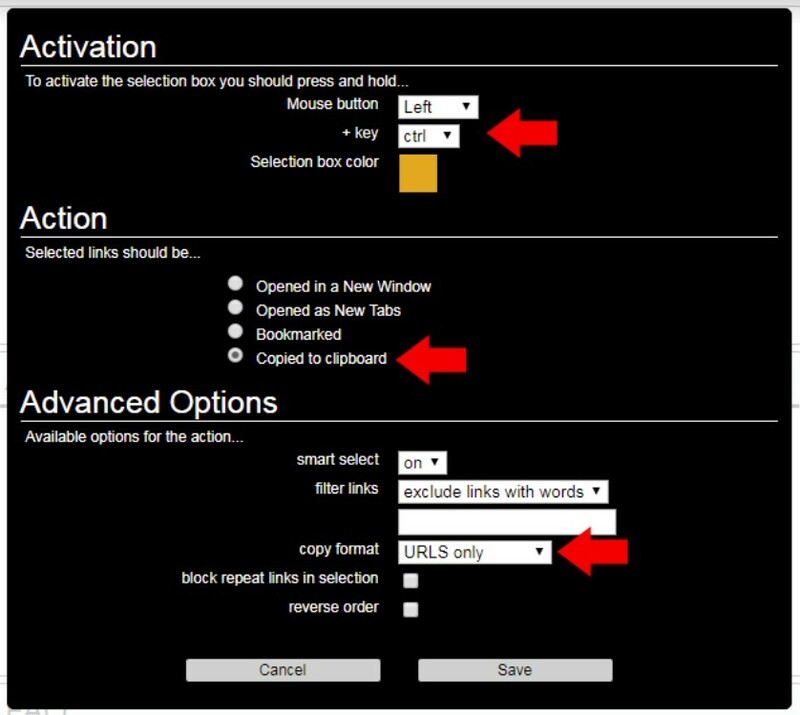 Release the left mouse button and CTRL after you reach the bottom of the page. Next, create a TEXT (.TXT) file on your desktop, or in an easily-accessible location of your PC. You can use any text editor for that. I like to use Notepad++. 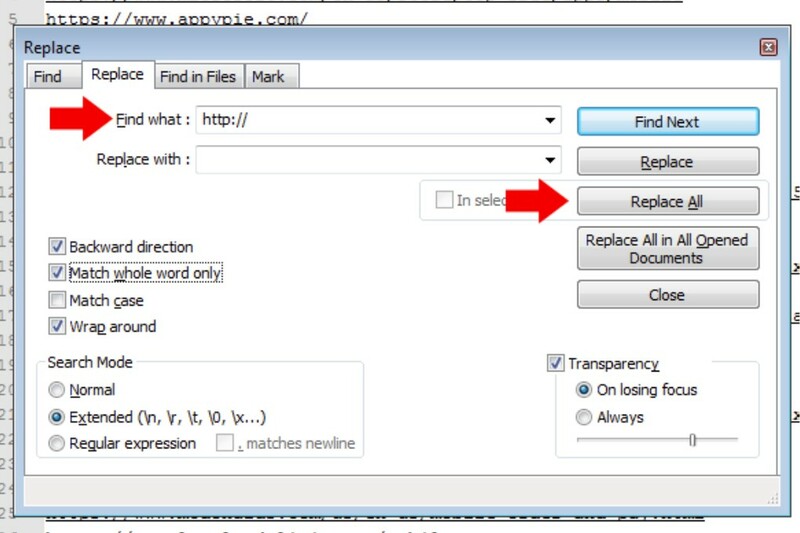 Click ctrl+V (on Windows) or cmd+V (on Mac), or right-click and select the “Paste” option to paste all the copied URLs. Now, you should have 100 URLs that you can target with your PPV campaign. You can repeat the search as many times as you want and for any keywords you want. You can also use Bing, Yahoo, YouTube, Amazon, eBay, etc. instead of Google Search. There’s only one thing left to do before you can paste the list of URLs to the targeting option of your PPV network. At this stage, all the collected URLs will include the “http://” and the “https://” protocol before the domain name. You have to remove these for your targeting to work. You don’t have to do this manually. With your text file opened, press CTRL+H (for Windows OS). A “Find and replace” window should show up. If your current text editor doesn’t have that option, I recommend you install Notepad++. In the “Find what” option, write “http://” and leave the “Replace with” option empty. Click on “Replace all” to remove all the “http://” protocols. Repeat the operation, but now replace all the https:// occurrences from the URLs. Now, you can select all the URLs by pressing CTRL+A (on Windows), or go to Edit-> Select All menu. Once all the URLs are selected, press CTRL+C, or right-mouse-click and the “Copy” option. Finally, paste (CTRL+V) all the copied URLs to the targeting option of the PPV network. That’s how you can find URLs to target with your PPV campaign without having to pay for a software. After you have set up all the keywords and URLs you want to target, it’s time to run the campaign. Check whether or not all the targeting options are correctly set. Then, match with the allowed promotion methods of your chosen CPA offer. After your campaign is approved, let it run until you have enough data to analyze for your tracking software. If your targeting is very specific and you’re lucky enough to find several good traffic sources, you might even see some conversions. However, with PPV traffic, it’s not likely that you’ll be able to see conversions right from the start, without first having to perform some tweaks to your campaign based on the data collected. Once you have enough traffic data, you can then start to block the source IDs and keywords that do not convert for you, based on the information provided by your tracking software. 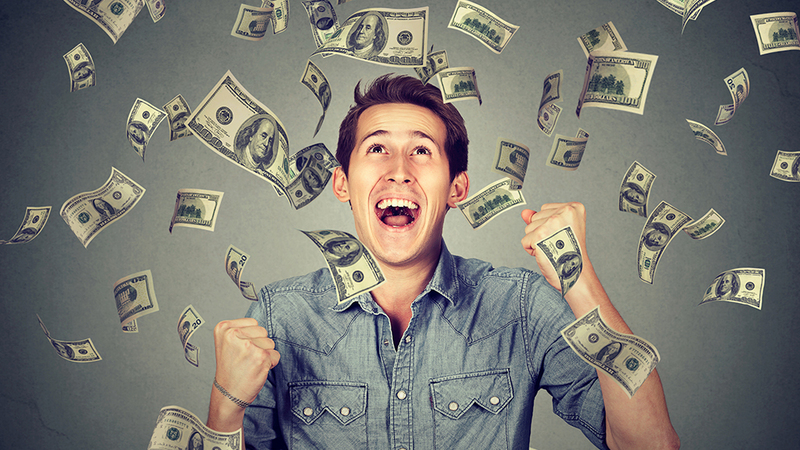 The secret to make PPV campaigns profitable is to constantly tweak your campaigns until you start to see good results. If your offer accepts a customized creative, you might want to do an A/B test with different landing pages, different headlines, and so forth. If your offer allows you to, you should go ahead and be as creative as you possibly can. Regardless of your efforts, some offers and verticals will work better than others. You might even see different results on different PPV networks. If you can’t seem to make your campaigns profitable after some time, you may want to kill the campaign and try another offer. 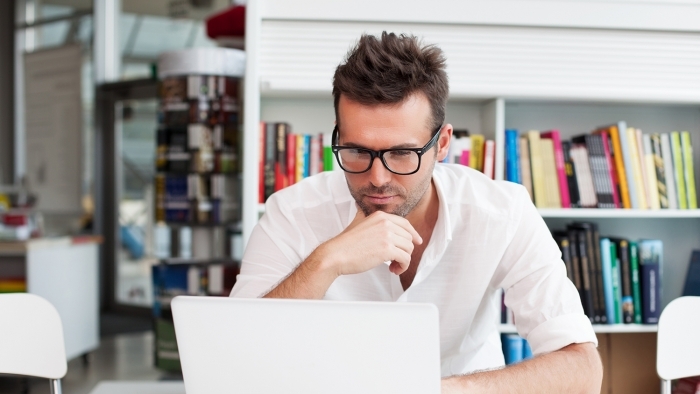 Finding a profitable CPA campaign with PPV traffic is not always easy. It takes work, time and patience to find the best keyword and URLs to target. You also have to perform many tweaks and block many traffic sources until you discover the best-performing ones. You also have to be a good data analyst and you need to closely monitor the information collected by your tracking software. Even though it requires work, PPV is a traffic type that can be extremely profitable, once you find one or more winning campaigns. Due to its low price, PPV can give you a higher ROI than any other paid traffic sources. Hope you’ve found this guide useful! You now have enough info to give the pay-per-view advertising model a try!